What do you get when you put 140,000 techno geeks into a city made for 24-hour gambling? The answer is CES, the annual Consumer Electronics Show in Las Vegas, which is full of mind-bending technology and an urgency not to miss ‘The Next Big Thing’. There were presentations from Twitter and Yahoo! big cheeses, while both Rupert and James Murdoch were taking meetings in hotel suites. My guess is they weren’t discussing smart washing machines – more likely when to partner with or buy a digital up-and-comer like Spotify or Vice Media. CES is not really a TV industry show (don’t expect to see kit to equip your latest edit suite), but among the prototype solar cars and (now affordable) 3D printers, there was a swathe of cool TV stuff, including curved and bendable displays, both for the wall and the hand, and talk about video distribution and monetisation. So here are some things that flicked my switch at CES, starting with a distribution bonanza. As the cost and size of tech components falls, there are increasing opportunities on so-called converged devices (those with screens and connectivity) for content owners and creators. New distribution outlets seem to be popping up all the time, and at some point they will all be looking for content deals. Chinese TV manufacturer and OTT set-top-box maker Roku announced the first Roku Smart TV, while Sony launched a virtual cable service using cloud technology for Sony TVs and PlayStation games consoles. Intel’s OnCue OTT service, which has been championed by former BBC executive Erik Huggers and may yet become part of Verizon, is another example of the diverse distribution landscape. One UK producer with whom I had a quick lunch at CES told me that all this distribution choice is very nice, but it needs even more careful windowing, especially as consumers will be the ones using their devices to pit different OTT services against each other, and against broadcaster-driven services. Ultra-high definition (UHD), or 4K, took up the big TV demonstration moments (okay, Samsung also had a monster 3D screen with day-glow glasses, but I’m not sure that’s ready for primetime). UHD is another potential cost hurdle for producers, but at least most new TVs will show both HD and UHD. The UHD pictures were being shown on curvy, very thin displays – some were even bendable. I’m not exactly sure how bendiness improves the picture, but the prospect of smartphones fitting neatly into back pockets makes consuming high-quality video content on the move even easier. 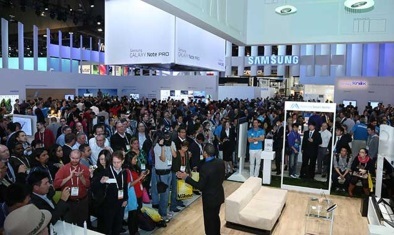 CES’s eye-tracking technology was also exciting. When you are taking a flight in the future, you might not even have to touch a screen to choose a movie – once your eye settles on an on-screen command, it’s as good as pushing a button. This puts the arm waving to command the Xbox in the shade. Finally, drones are definitely ‘in’. Amazon has already talked about delivering goods via drones and at CES there were many on display, including those that can collect content using tiny cameras. For documentary film-makers, that could be a really smart idea.